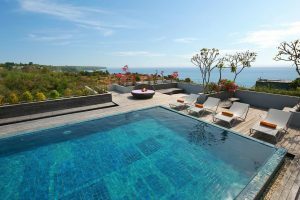 Stay at 5-Star Resort in Bali for only €37/night or €18,5 p.Pers. Hello Travelers, we found a super luxury hotel deal on the beautiful island of Bali. Make sure you take this great hotel deal for your memorable holidays here in Bali. At the moment you can book the top rated 5-Star Klapa Resort for only €37 per night per room ++ (for max 2 persons). This offer includes breakfast for two! But hurry up, this offer might be gone soon..
Bali is an island and province of Indonesia. The province includes the island of Bali and a few smaller neighbouring islands, notably Nusa Penida, Nusa Lembongan, and Nusa Ceningan. At Klapa Resort a 5-star suite hotel you will find the one and only hotel that blend the hospitality and the grace of Bali engaging people with quality of services when your experience and journey begin. 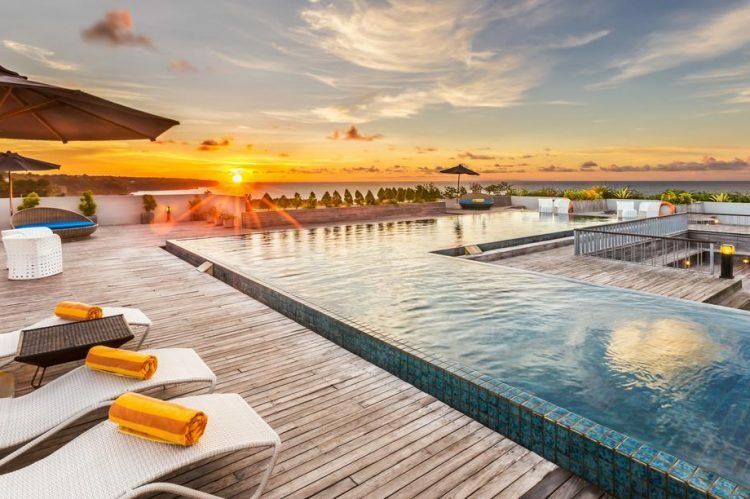 Experience your Bali holiday at Klapa Resort with chill out by the rooftop swimming pool while watching & enjoying the sun go down into India Ocean, relaxing & chilling out at lobby lounge. This property is 1 minute walk from the beach. Perched on a cliff in Uluwatu just a stone’s throw away from Dreamland Beach and a 15-minute drive from Jimbaran Beach which is lined with fresh seafood dining options, Lexington Klapa Resort offers a Mediterranean inspired accommodation with a free WiFi access throughout. The hotel is located within a 5-star golf course and features an outdoor pool. The spacious rooms are well appointed and fitted with air conditioning, flat-screen cable TV and a personal safe. There is also a seating area with sofa, an electric kettle and minibar. Guests can enjoy the view from the balcony or terrace. The en suite bathroom comes with hairdryer, shower and robes. The on-site restaurant, Golf Terrace Restaurant, serves a selection of Indonesian, Chinese and western food. In-room dining options are available.